The “Mindfulness” Craze—What’s It Got to Do with Art? I want to talk to you for a minute about mindfulness. Wait! Before you hit “delete”, please hang in with me for just a little bit. I promise I will get back to art and creativity in a minute. Mindfulness is trendy. Everywhere you look there are articles on the health benefits of a meditation practice. The business world has embraced “mindfulness” as the latest productivity hack. (Aaaack!) A recent article in the Harvard Business Review called mindfulness a “must-have” for the busy executive who wants to get ahead. These articles touting the benefits of meditation typically end by suggesting that you can become calmer, kinder and more productive by taking 5 minutes a day to “just sit and breathe”. Advice one writer appropriately dubbed “McMindfulness”. Now, I’ve been meditating for a loooong time, so please don’t think I’m trying to discourage anyone from having a meditation practice. But, I’ve also talked to many, many people who’ve struggled to maintain a meditation practice. If you spend 5 minutes—or 20—sitting quietly beating yourself up because you can’t stop thinking, dammit! and worrying about all the time you’re wasting, you’re unlikely to find it terribly beneficial. That isn’t what meditation is all about, but even with better understanding, a lot of people still seem to have a tough time sticking to a meditation practice, especially if they are trying to do it on their own. I think one possible reason is that it seems too simple, especially when you are just starting. It seems kind of boring and a waste of time. I mean, really, do you find your own breathing all that fascinating? And it doesn’t feel like anything is happening. At least when you do your exercise routine, you can tell that you’re sweating and breathing hard. With a meditation practice, it’s hard to feel any immediate change. So now we come to the “art” connection. Here’s a little “quick fix” to becoming more mindful, more present and more appreciative of what’s all around you: make art. 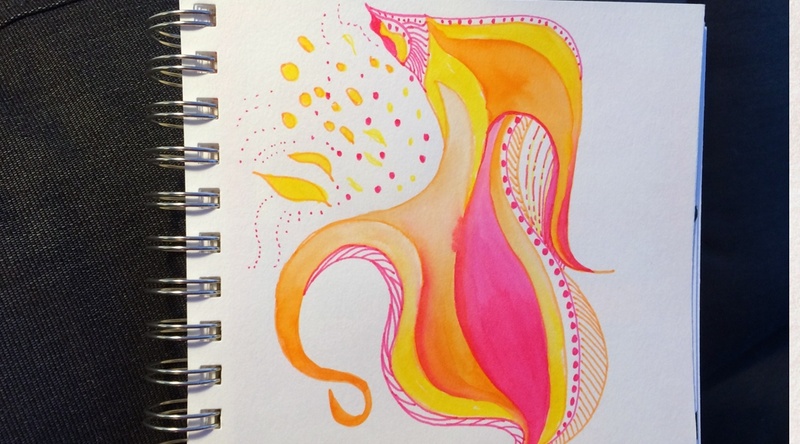 As I write this, we are in day 9 of the 30-Doodles-in-30-Days challenge. Some people are doing the challenge to motivate themselves to practice technical skills, but for me, it’s about reminding myself to notice. No one has remarked on it yet, but many of the daily doodling prompts involve senses other than sight. I’ve suggested doodling the scent of a lemon or the sound of the music you’re listening to, or the feeling of celebration. The prompts that do have to do with vision are generally about things that would normally not be “subjects” for art (not by themselves, anyway): the weave of a fabric, shapes in your pet’s fur, the movement of a candle flame. Now, people could (and some do) pick out the nouns in each prompt and illustrate them. So, some draw lemons, sheet music, and party hats. Some draw their (entire) pets, or a whole piece of cloth. That’s the sort of thing that you do if you are trying to develop a sketching habit, and that’s what some of the doodler’s want from the challenge. But the prompts are written to entirely bypass popular notions about what art-making (especially drawing) is all about. I have a hidden agenda—to help people really notice small parts of their everyday lives, i.e. to help people be more mindful and present. If you start thinking about how you might “doodle” the scent of a lemon, you actually start to attend to the experience much differently than if you just sit down to “draw a lemon”. If you develop a “sketching” habit that is about engaging all your senses and representing entire experiences visually, you have to really stretch yourself. You have to attend more fully. You have to really experience that lemon’s tangy-sweet aroma. Any sort of sketchbook will help you see and attend more fully, but trying to sketch non-visual aspects of experience is particularly powerful. Try this experiment: sketch a lemon, then spend some time holding and smelling and experiencing the lemon, and then try to represent the experience of the lemon in some sort of doodle, drawing, or painting using color and line and shape without making it overtly look like a lemon. I’m willing to bet that while you were preparing to represent the entire experience of a lemon—the scent, the heft, the pebbly skin, the mist of lemon oil and juice in your face as you peel it—you were deeply present to that lemon experience, deeply mindful in a way that you normally are not. Okay, but that was one lemon. Who has time to cart around a sketchbook all day experiencing stuff? A curious thing happens once you start making this sort of multi-sensory-based art regularly. You start noticing. You start seeing all sorts of things as “subjects” for art-making. You start stretching and deepening your experience of the things that are all around you, every day. Do I take time to doodle all this stuff? Of course not! But I do notice more and differently. Everything becomes a possible “subject” for art. So this week, whether you’re doing the doodle challenge or not, I challenge you to try “doodling” things that can’t be seen—the crunch of snow underfoot, the feel of a soft blanket, the little sounds your house makes warming up in the sun. What will you discover that you’ve never noticed? What will you re-discover that you haven’t really seen since you were a child? How will your world, and your vision, expand?